Self-help books are a great way to develop motivation and insight into any part of your life that you may be struggling with. The problem, however, is that they seem to be everywhere these days! With such a wide variety to choose from it can be hard to find one that will really resonate with you. 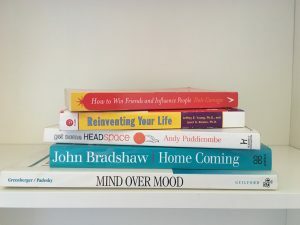 What follows are five self-help books that I highly recommend anybody to read. A complete classic. This is one of the first self-help books and referred to by many as the best. Written in 1937, this book has stood the test of time and still remains immensely popular today. The main idea throughout the book is how to get people to like you and bring them over to your way of thinking. The emphasis is more towards business success and there are some real golden nuggets about to effectively communicate with others. This is quite in depth for a self-help book. There are some great exercises throughout and everything is outlined in an accessible way. There are also parts of the book that go into psychological/psychotherapeutic theory. The main focus of this book is what’s known as ‘inner child work’. This is getting in touch with the different stages of your childhood development and working on any trauma experienced during those stages. I would advise going steady with this book and seeking counselling alongside if required. I recently wrote a small review for Homecoming on goodreads, click here to read that. This is a self-help book based around the ideas of schema therapy, which was created by Jeffrey Young. Schema therapy draws a lot of its ideas from cognitive behavioural therapy (CBT) but also integrates ideas from other schools of thought (such as psychodynamic and gestalt). This book is a great way of introducing these ideas in a way that is relatable. If you find yourself trapped in certain destructive life patterns then this book is definitely worth a read. The original CBT workbook. Mind over mood takes you systematically through the principles of CBT, one exercise at a time. The emphasis throughout is on actively doing each exercise. These involve filling out charts, tables and a mixture of journal-like entries. Expect to be active with pen and paper frequently throughout the course of this book. Headspace is a guided meditation platform, made famous by its app and website content. This book was written by the founder (Andy Puddicombe) just after he started to company. The book is good as a stand-alone and does not require you to have used the website or app prior, or during, reading (I didn’t). Get some Headspace is really good at demystifying the practice of meditation. It outlines numerous techniques that can be easily implemented in your day-to-day life as well as explaining some of the benefits of a daily meditation habit. All of these books are different from each other and hopefully, between the five, there will be something that is beneficial for everybody. Self-help book are a great way to practice personal growth and development however they are one tool amongst many. These books are most effective when combined with other modes of self-development. This could be personal therapy, coaching, journaling or assistance from friends and family. I hope these books serve you well and remember to enjoy the journey!